Zhik has been at it again, expanding their line to meet the needs of racing sailors. With their ever-expanding line of clothing, they’ve added and redesigned shorts to further make their mark in the sailing world. Their boat shorts underwent a redesign this year, making them even more rugged to stand up against tough decks. They’ve also added a new boardie short, a classic board short with a little Zhik styling. Both are comfortable and fashionable to keep up with the active racer. Available in women’s sizes, too. Ladies don’t be fooled, these are Australian sizes so they run differently than US Sizes. For all of those board short lovers out there that find board shorts can’t quite hold up, this is the answer. With all the feel of a traditional board short, the Zhik Boat Shorts have a webbing belt waist with two eyelets on either side. It works well for a nice tight waist. The best part is they have the durability of a sailing short with the durability needed to stand up against tough decks. For anyone looking for a nice board short to sail in, this is the one. With the feel and cut of a regular board short with added reinforcement on the seat, these would be your go-to shorts. 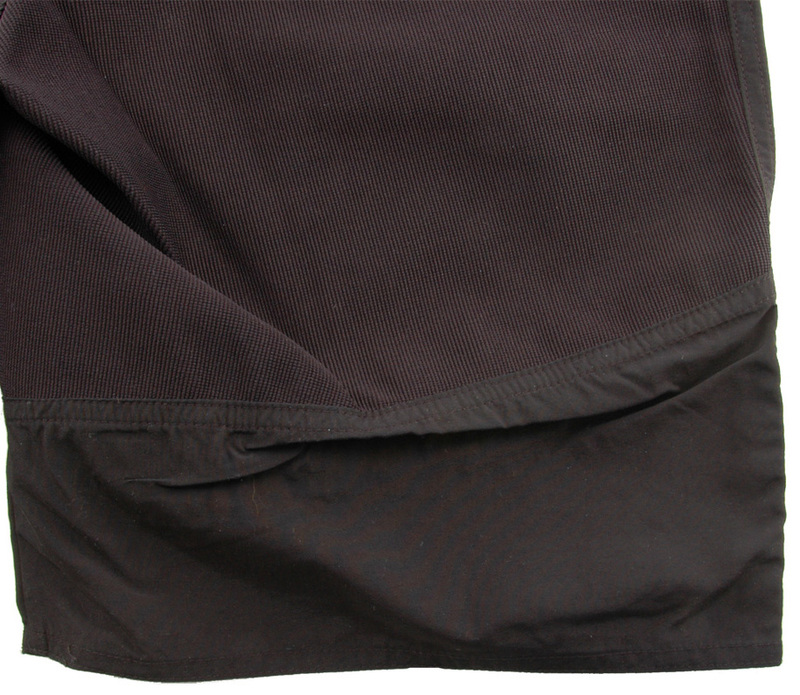 With two side pockets and two front cargo pockets, there are placed to store and easily access your knife or other accessories. The back doesn’t have a pocket, so you won’t be sitting on anything awkwardly. 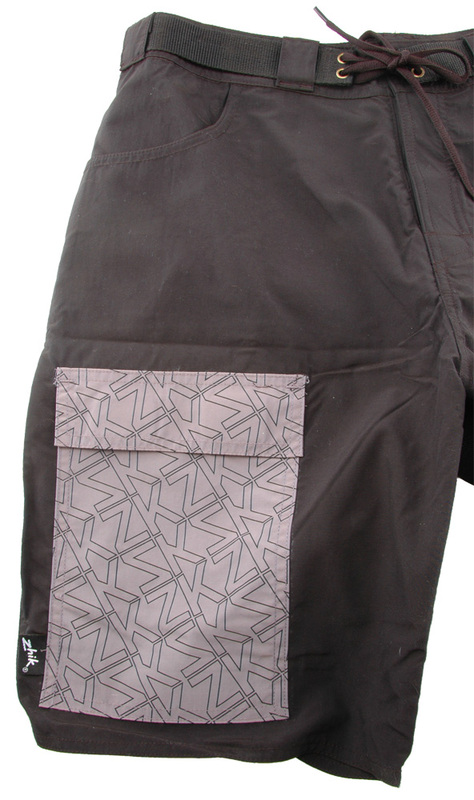 The rear panel is made of ZhikTex material, a durable but soft fabric. The feel is almost like corduroy, with vertical lines in the fabric. It flexes for a more comfortable, less Spongebob Squarepants feel (that you often get with rear reinforced shorts). Although there are reinforcements in the seat, it’s still up for debate how effective these shorts will be when put to the test. They have a soft feel, leading me to believe that they wouldn’t be as hard-wearing as other sailing shorts. The hand pockets are small, with barely enough room for your hands, but I’d suspect that you wouldn’t use them to store anything as you’d likely default to the conveniently placed cargo pockets. The ladies’ Boat Shorts were not quite as flattering as the Boardie shorts, that had more stretch to them. With a true board short look, they were long and sort of baggy. Although not a problem for the guys, they won’t be winning any girly sailing short contests. They are comfortable, light, and reinforced, which is about all you can ask for in a sailing short. With a board short style, they are longer in length with a drawstring waist for that perfect fit. 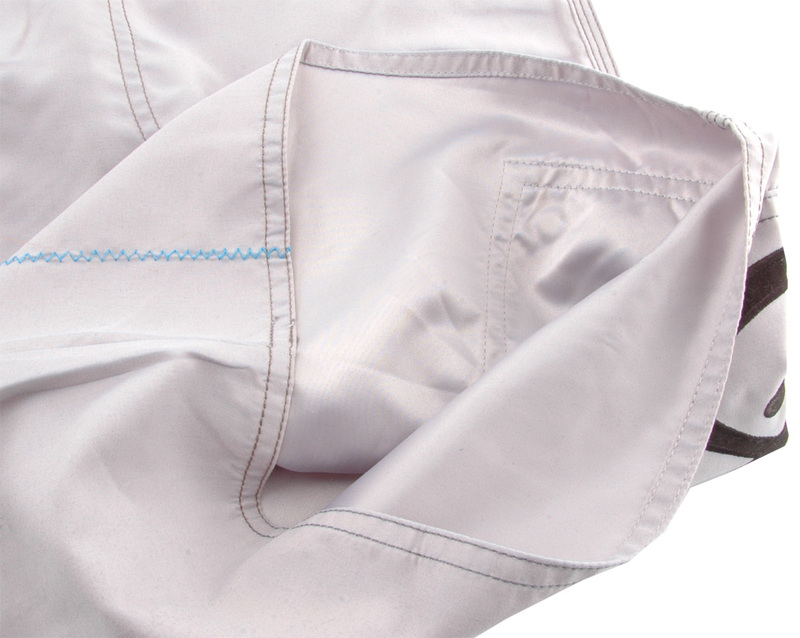 Stylish, innovative, and comfortable… the Boardie shorts are just about all you could want in a sailing short. Comes in two great colors, Ash and Cyan (a radiant blue color) and has contrast/accent stitching throughout. They are very stretchy and move with you. The overall feel is really nice. The inside has a silky feeling that doesn’t stick to your skin and gently glides over it. The outside has a more rugged feel while still remaining soft and comfortable. The styling is nothing like the typical sailing short. The Ash has light blue accent stitching and the Cyan has black accent stitching to make them a little more interesting. Complete with a contrast line of stitches on the front and back (see picture to the left). The back pocket is black for some more funky styling. There is also a revolutionary breakthrough in comfortable closures on the waist. Behind the Velcro is a stretchy gusset for a little extra protection against the Velcro. It’s a light fabric, so it doesn’t feel bulky. With five pockets (two hand pockets, two side cargo, and one rear cargo), you won’t have trouble storing all of your extras. 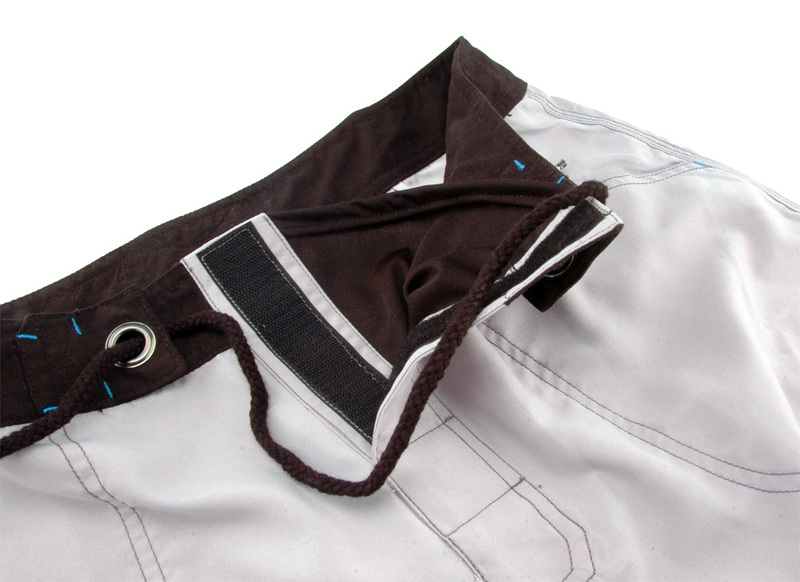 Although the gusseted Velcro closure is great, there is only one eyelet to tie to and no belt like the Boat Short. So it would be harder to get a tight fit, but with the increased stretch, a smaller size might work, too. 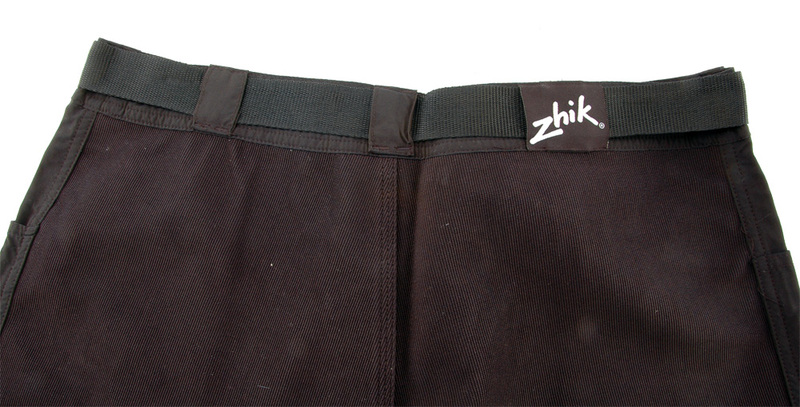 Without reinforcement and being a light fabric, I’m concerned about the longevity of these Zhik Boardies. Long days sliding across non-skid would probably do a number on them so I would leave these for more sedate days. I was hoping the Ladies’ Boardie Shorts would have a little bit more feminine length, but they fall right above my knees. They still have nice stretch without being too tight, making them a nice short none the less. With an extra comfortable, silky feeling inside, good stretch on the outside, and gusseted crotch, these shorts certainly are comfortable. 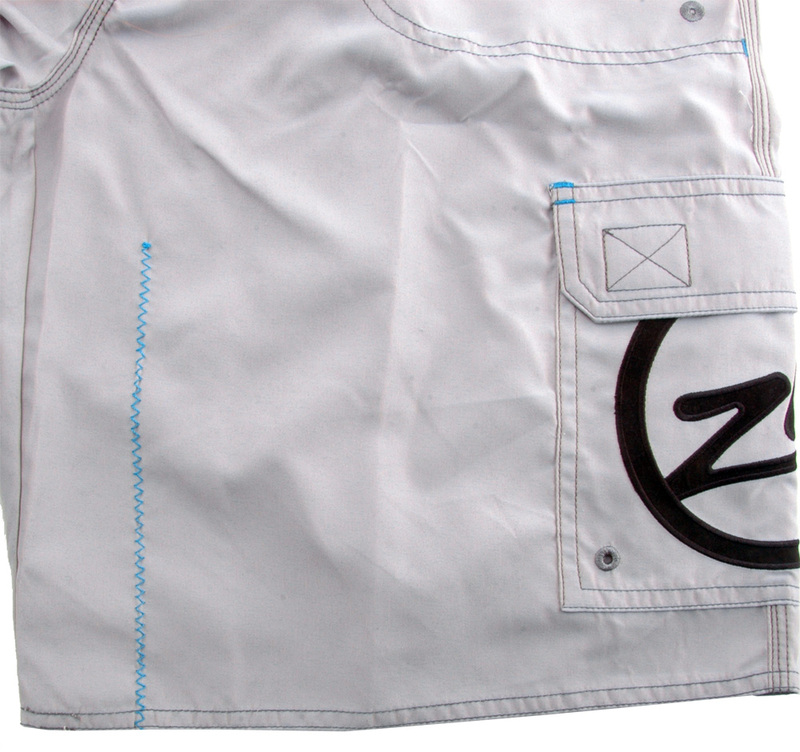 With stylish accents and multiple pockets, I think these would be some of your favorite sailing shorts. Both great shorts from Zhik, the Boat Shorts and the Boardie shorts are designed for the active sailor in mind. With a definite Zhik style, these shorts give a new look to a classic design. Comfortable, stretchy and lightweight, these two will work well whether you’re sailing, surfing, or beaching. Comment from Zhik head office. The Boatshorts have been tested for a number of years now and we have had absolutely no failures to the durability of the rear fabric. I mention this [because] we now have proof it is great! Thank you for the detailed reviews. It's great to see that shorts have become a bigger part of mens fashion than ever before.